Friends and fans we have an announcement to make! 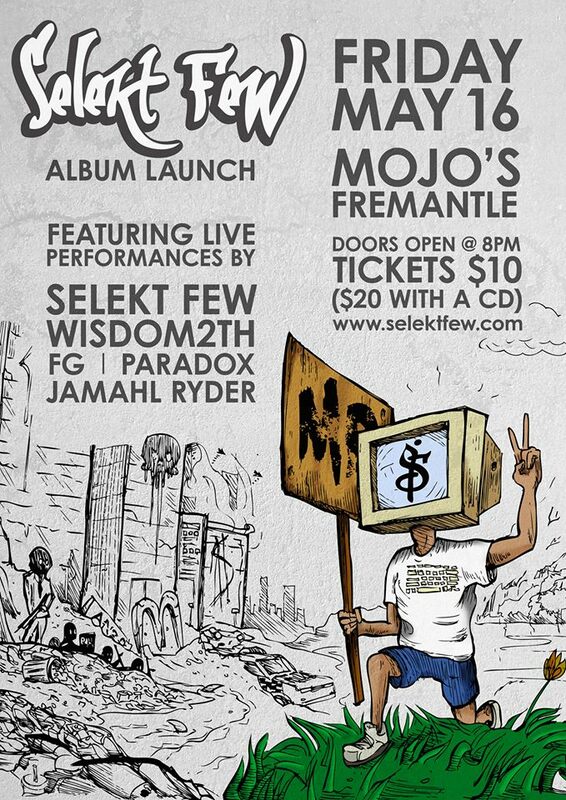 Selekt Few are holding an album launch gig for the debut LP entitled “MD”, on 16 May at Mojo’s in Fremantle. We’ll be supported by some of our favourite local hip hop talent; FG, Jamahl Ryder, Paradox and Wisdom2th. For the last five years we have been practising, recording and mixing our own music and we are finally happy enough to put out a release. Over the years, many of you have given us advice or otherwise shown us support. Now we want to invite you to buy an exclusive Launch Ticket + CD combo for just $20! There are only 250 tickets available to the launch. It will be a great night with some of our favourite local artists and many of our closest friends, family and fans attending. This is a great opportunity to get all of you who have supported us together, in one room, for an enjoyable evening hearing the fruits of our labour. Sure, we want to sell some of our CD’s. But the primary focus of this event is getting our friends and family together to see and hear what all that time we were spending was for. We need your help to make it happen, there’s no turning back!!! Buy your tickets now and join our Facebook event! This entry was posted in Album, Gigs and tagged 2014, album, australia, CD, Fremantle, hip hop, Launch, may, Mojo's, perth, selekt few, Ticket on March 17, 2014 by Shareef.